Patrickswell Brownes: SOLD . . . to the highest bidder . . .
SOLD . . . to the highest bidder . . . 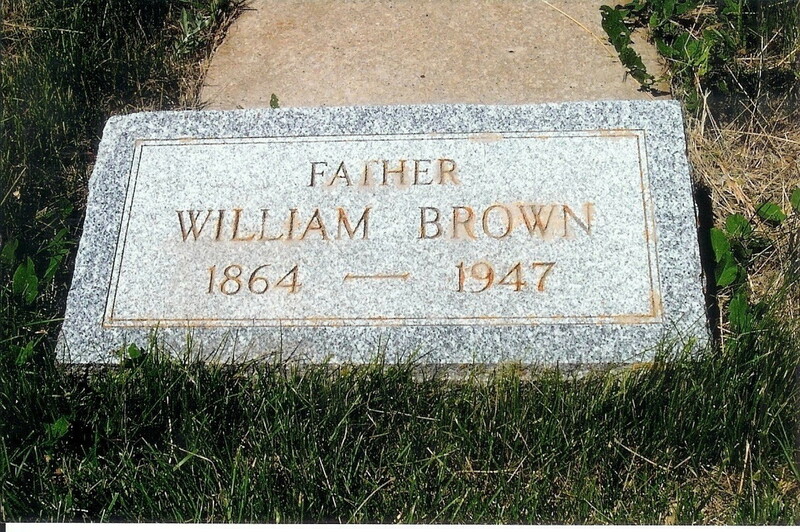 The last blog posting stated that William Henry Brown, the youngest son of John and Ellen Brown at the time of John’s death1, was living with his Uncle Patrick in McLean County, Illinois by November 1879. (William Henry had likely traveled to Illinois earlier with Patrick when he returned home after Ellen’s death in April 1878.) Although he was still a minor, he was the first of the children to leave the Columbus, Ohio area. (See previous post for John and Ellen) In this post, we will take a closer look at William Henry’s life. The following information was submitted by Don, a descendant of William Henry Brown. Page four of the Brown letter of 19432, shows a “?” for his Baptism date. Also a brother, Thomas, is listed in the same letter as being baptized on April 19, 1864 Baptism. (See previous post for John and Peter.) It would be impossible to have two children born on different days in April 1864. There is no evidence of a Baptism Certificate for William Henry. Perhaps it was lost, not registered, or just not done. His father, John Brown, was killed in 1873 after being run over by a train he was hitching a ride on. His mother, Ellen, died from breast cancer five years later in 1878 leaving him and his siblings orphans. Patrick Brown, a brother of John Brown, took William Henry in after Ellen’s death. Patrick who lived in McLean, Illinois had ten children of his own. He also was raising two other nephews, James and David Roach, who were children of his sister Johanna. The other siblings of William were taken in by other family members. In the 1870 Federal Census in Ohio, William Henry was listed as two years old; and, the 1880 Federal Census in Illinois shows him as eleven years old making his year of birth 1868. In all other Federal census records, his age is consistent with the 1870 and 1880 census. He may have gone to Nebraska with Patrick in the late 1880’s but there are no records of that. It is more likely that he moved to Nobles County, Minnesota about 1888, the same time as Mary Ann Brown and James Cox, a daughter of Patrick Brown and her husband3. (See information about Mary Ann and James Cox in the previous post, " . . . and he leaves a large family to mourn his death.") William Henry is listed in the 1905 Minnesota State Census in Adrian, Nobles, Minnesota4. The record shows that he had been a resident of the area for seventeen years which would put his entry into Minnesota about 1888, the same time as the Cox family. While in Nobles County, he met and married Margaret Elizabeth Hendricks on January 11, 1893. She was the daughter of James Hendricks and Margaret Brobender. Margaret Elizabeth was born on February 22, 1869 in Terre Haute, Vigo, Indiana. 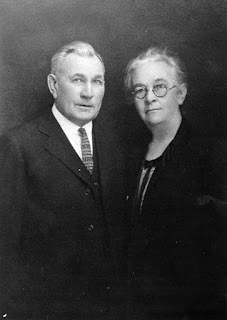 Eight of their ten children were born in Adrian, Nobles, Minnesota: John Edward “Ed”, Mary Agnes Henrietta “Ag”, Claude William, Margaret Ellen “Nellie”, Martha, James Francis “Jimmy”, Cecilia Emily, and Ann Irene. William Henry and his growing family, four children by this time, are listed in the 1900 US Census in Olney Township, Nobles County, Minnesota where he was renting a farm5. Based on neighbors shown on the census record, the farm was likely located just southeast of the town of Adrian, also in Olney Township. The 1905 Minnesota State Census shows him living on Second Ave, in the town of Adrian. (See above.) His occupation is given as “auctioneer,” a vocation he followed the rest of his life. The 1910 US Census shows William Henry, again a farmer, in Mountrail County, North Dakota6. This location is in the very northwest corner of the state. What prompted him to move to a seemingly out of the way place? William Henry was raised by his Uncle Patrick, who himself and his family, seemed to travel great distances to find better opportunities. Perhaps it was this environment that encouraged William Henry to seek alternative locations. Events in Minnesota may have also affected his decision to move to North Dakota. As we saw earlier, William Henry was listed as a farmer in the 1900 US Census. In July, 1903, a devastating hail storm hit the area where his farm was located. A long wet season followed the storm with about six inches of rain in six hours falling on September 11th alone, completely wiping out the crops for that year. Several wet years in succession ruined many farmers7. Perhaps this affected his decision to re-locate to North Dakota where he remained the rest of his life. Land was available for homesteading when William Henry moved to North Dakota, and, he took advantage of this. (Another reason that drew him to the state?) 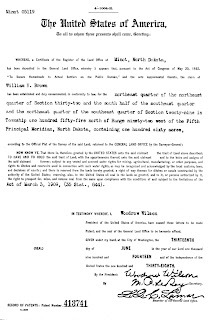 Bureau of Land Management records show that he had two plots of land in sections 29 and 32 of Alger Township, Mountrail, North Dakota, just southwest of Stanley, the county seat for Mountrail County. The first was forty acres purchased in 1910 as a “cash entry.” The other property was an “original entry” homestead finalized in 1914 consisting of 160 acres8. William Henry appears to have been one of the leaders of the Mountrail area. The site chosen for the new county courthouse in Mountrail County was a topic for much discussion in 1913. William Henry attended a “mass meeting” to consider its location. He was mentioned in an article in The Stanley Sun in September 1913 under the heading “MASS MEETING ON COURT HOUSE SITE9.” He certainly gave his opinion on the issue. Included in the article was the following. “ . . . 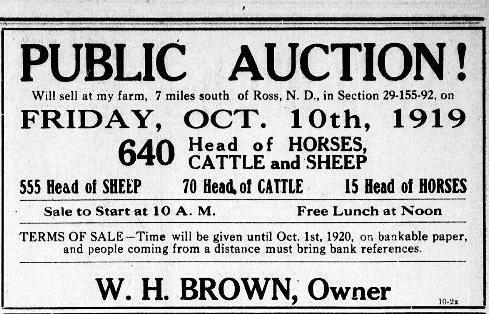 The meeting was address by several of the Stanley people and W. H. Brown, who lives south of Ross, and who is the leading auctioneer of the county, spoke on the subject. He stated that he had possibly talked to more farmers in the county than any other man in the county, as that was his business, and that he believed that 95 percent of the farmers were in favor of the half block donated by the city three years ago . 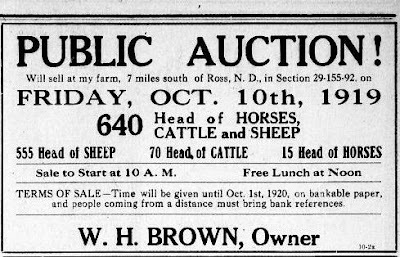 . ." William Henry was elected to the board of directors of the newly formed North Dakota Auctioneers Association in February 1920. The same month, he was also named director from Mountrail County for the Mouse River Loop Pure Bred Livestock Association, another newly formed group. In February 1922, he was named a director to the Northwestern North Dakota Potato Growers’ Association. In March 1919, William Henry entered a “short-horn” Bull in the prestigious Ward County Breeders sale10; and, he was listed as the auctioneer for several livestock auctions held in the area. While William Henry continued to maintain his residence in Stanley throughout the rest of his life, he also maintained the homestead, and, according to another grandson, always had livestock on the property, cattle and horses, which the family bought and sold as part of their auction and cattle business. His oldest son, John Edward “Ed’, was also an auctioneer. His youngest son, William Joseph “Pat”, was a cattle buyer, buying and selling as a family business. Pat was named “Cattle Buyer of the Year” for a number of years. William Henry was active in the business until a few months before his death from colon cancer. He died July 6, 1947 in a hospital in Fargo, North Dakota. He is buried in Fairview Cemetery in Stanley, ND. Margaret, his wife, preceded him in death September 26, 1935. See the attached obituaries from The Stanley Sun. In the next post, we will continue looking at the children of John and Ellen Burns Brown. 2. Brown, David, Kewanee, IL, 11 May 1943, Letter to Esther _______, Columbus, OH. Records from the Catholic Record Society also confirm Thomas’ baptismal date as May 7, 1864. 3. The Petition for Letters of Administration in the estate file for Patrick Brown identifies three children living in Adrian, Minnesota at the time of his death in 1891; Mary Ann Cox, age 34, James E. Brown, age 25, and Hannah K. Brown, age 21. Since the original research on Patrick’s children was done, I have discovered a marriage record for James E. Brown in Box Butte County, Nebraska to Jennie Phillips. Witnesses were David Brown (a brother of James or perhaps a cousin, a son of John Brown and Ellen Burns) and John Phillips. The record is dated August 26, 1888 and definitely shows his parents as Patrick Brown and Ann Burns. Alliance in Box Butte County, Nebraska was identified in the same Petition for Letters of Administration as the residence of Emily Julia Brown Betebenner, another daughter of Patrick Brown. The original research showed that James E. Brown married Jennie Barney about 1893. Perhaps this was an earlier marriage for James E. Brown and James had moved back to Minnesota by 1891, the time of his father’s death. Additional research is needed to follow up on this new information. 4. Minnesota State Census, 1905, database with images, William H Brown, Adrian, Nobles, Minnesota; citing p. 169, line 39, State Library and Records Service, St. Paul; FHL microfilm 9328,798. https://familysearch.org/ark:/61903/1:1:SP3V-7FS : 15 November 2014. 10. 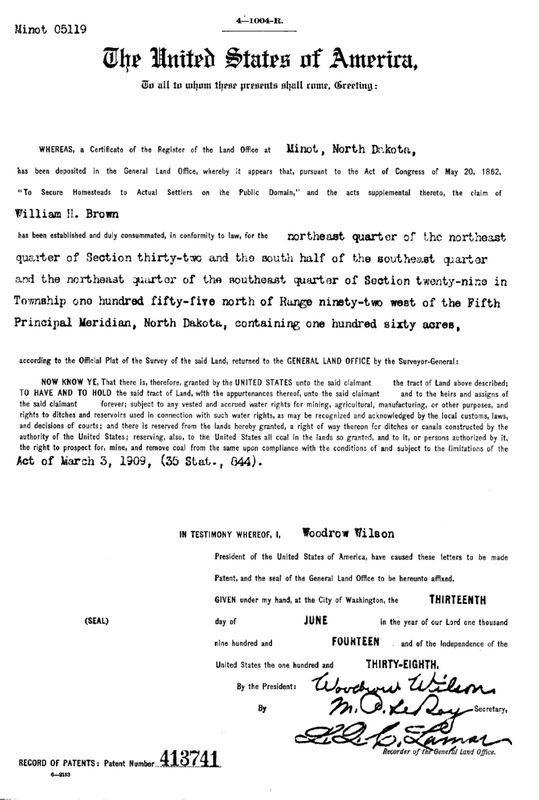 Information concerning his membership, and leadership, in many of the associations concerned with farming and raising livestock in the area was taken from The Ward County Independent, a newspaper located in Minot, Ward County, North Dakota, just east of Mountrail County where William Henry lived. Online information, through the Library of Congress’ Chronicling America site, is only available until 1922. I’m sure that a review of The Stanley Sun (sadly not available online) in Stanley, Mountrail County, and The Ward County Independent through 1947, the year of William’s death, would reveal additional information about his social and business dealings in the community. I enjoy continuing to learn about the family. Thanks for your efforts.